Internet Explorer/Edge does not support the html tag 'details' yet (view and hide on demand). In these browsers, the entire content is expanded and displayed a bit confusing. The diary index provided here describes bibliographically the diaries and "Wanderbriefe" by Otto Dempwolff (1871-1938). Otto Dempwolff called such letters as "Wanderbriefe", which were addressed to his parents and should be passed on to the circle of acquaintances. They are also referred to below as diaries. The collection contains over 900 pages in 36 diaries. The rights to publish the diaries are currently available exclusively with his heirs. Private correspondence (several thousand pages) remains private with few exceptions. The letters are almost all without envelopes. A philatelic use does not exist. The state of preservation is almost without exception good and does not affect legibility. 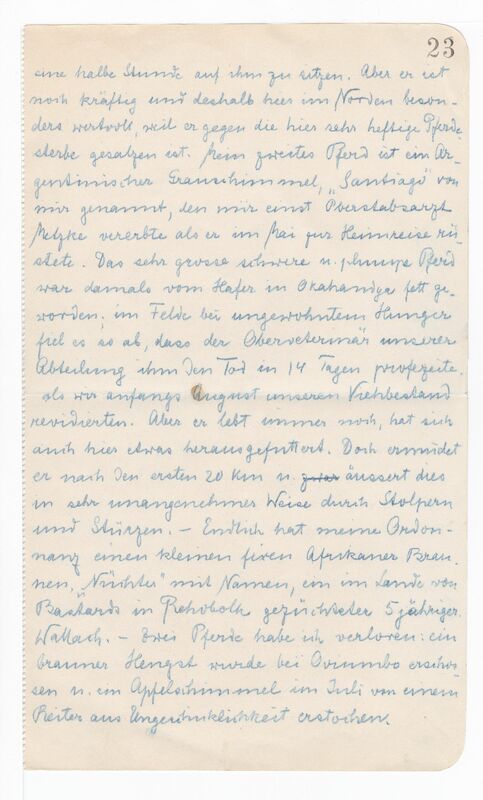 Legibility is affected by the use of a Kurrent handwriting (in his father's transcripts) and by the use of a small handwriting (in some of Otto Dempwolff's postcards). All diaries are written in German. (Otto Dempwolff, 1904 in South West Africa, five diaries with a total of 105 pages). (The transcript No1 of the diaries from the period January to July (P07 = 7 month) 1904 in South West Africa, total 36 pages). An optional suffix _YYYYMMDD indicates the scan date. Medium 2: 1 sketch "Dallmann-Einfahrt, Friedrich Wilhelmshafen, …"
Scope 2: 1 sketch "I) Astrolabe Bai"
Scope 3: 1 sketch "II) Kurrisches Haff"
Scope 4: 1 sketch "III) Skizze von Friedr. Wilh. Hfn." Scope 5: 1 sketch "IV) Mein Wohnhaus (My house)"
Scope 2: 1 sketch "Skizze meiner neuen Wohnung - Juli 95"
Scope 3: 1 sketch "Skizze der Hütte am Hansemannberg"
with the note "Zum Familienbrief vom 3.August 1895"
6 Blätter 24, 25, 27, 34, 35 und 36 herauszunehmen und zurück zu behalten." 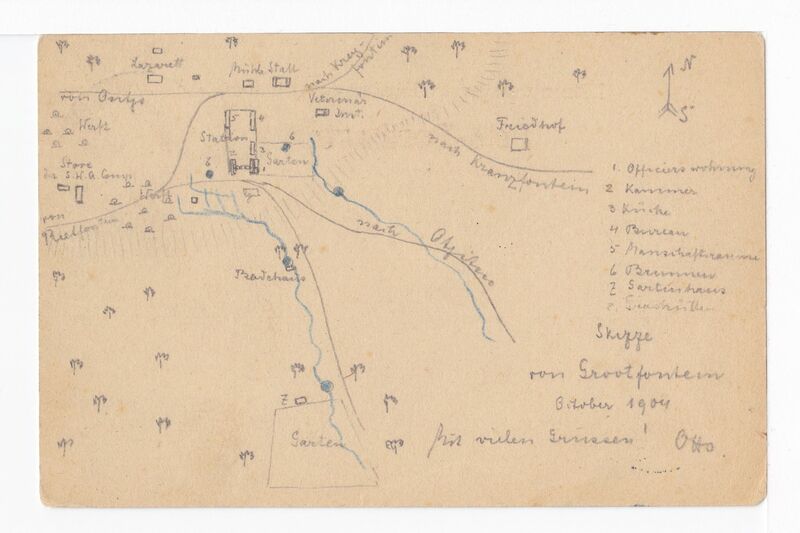 (Before sending the large diary sheets, the 6 sheets marked "Private"
an die Schwester vom Rothen Kreuz "Auguste Hertzer"
zu Herbertshöhe in Deutsch-Neu-Guinea geschickt habe." to the sister of the Red Cross "Auguste Hertzer"
Note 3: The booklets/diaries are labeled as "Big Diary" or "Small Diary"
Place of creation: steamship "R.P.D. Gouverneur"